A McDonald's employee in Jacksonville, Florida, took justice into her own hands on Thursday after a customer reportedly came up to the counter and threw a drink on her. Shocked by the sudden surprise of a cup of coffee being thrown on her, the golden arches employee came out from the counter and repeatedly shouted, "did you throw that drink at me?" Once face-to-face with the customer, she slapped her, sending the patron's glasses to the red-tiled floor. Footage of the altercation was shared on social media on Friday. ​"What's up, what's up," the employee yelled, before daring the woman to call the police. 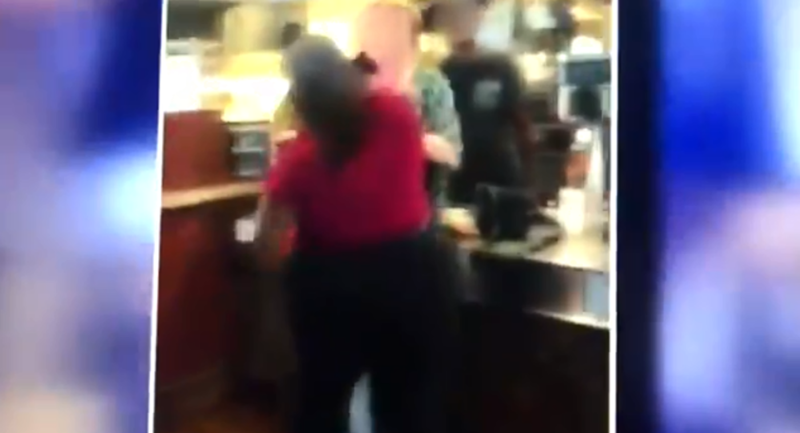 Although the stresses of the fast food industry are endless, several bystanders who saw the brawl go down told local media outlets that they weren't in favor of the employee's behavior. "I'm speechless. I'm blown away by that one," Eddie Ford, a customer, told Action News Jax. "I think it's totally unprofessional." "Your job is customer service and you come [out from] behind the counter and fight a consumer? That's crazy. You're the face of the company," he added. In response to the incident, McDonald's owner Debbie Moreland released a statement saying, "I do not condone the behavior depicted in this video. We are currently investigating this matter," WJAX reported. It's unclear whether the employee is still with the company. The report follows a March incident in which 37-year-old Jedediah Ezekiel Fulton was arrested for attacking the arches of a McDonald's restaurant in Oregon after his order of 30 double cheeseburgers was rejected.